This is a survey launch lowered to deck level on a calm day. The bow and stern are attached to the davits by thick line. Notice how you have to step across the space between Rainier and the launch. The past few days have been “typical” Alaska weather—fog, drizzle, moderate winds. This morning I was quite surprised when I looked out my stateroom porthole. The weather was supposed to have calmed somewhat overnight; however, it was obvious that a good blow had picked up. White caps covered the water’s surface. I was scheduled for a launch, RA-4 (each of the launches has a number 1-6, RA being the abbreviation for Rainier), but I decided not to board at the last moment. When the launches are lowered to the side of the ship, the bow and stern (front and back) are secured with line to minimize movement. To board the launch, you have to step across a 1-2 foot gap from Rainier to the launch. Today’s conditions amplified the heaving and pitching motion of both the ship and launch and made the distance between too far for my short legs. I chose safety over adventure today. As the launches continued to be deployed, Rainier began to transit from our anchorage north of Wosnesenski Island to our previous anchorage position in a small cove off the southwest corner of Ukolnoi Island. Having the flexibility to change the ship’s direction was essential for the safe deployment of launches today. Personnel and equipment could be protected from the force of the wind and waves (which topped 6’ at times). Although disappointed that I did not make it onto my launch, I was given an opportunity to watch the deck crew in action. I learned that this morning’s weather was some of the worst that the crew has seen during this survey season, however, work can be completed in conditions that are more blustery than today. As a member of a survey team, you have to put your trust in the deck crew and their talents and skills. Jimmy Kruger is the Chief Boatswain. He is in charge of the deck and its crew. In a way, he is like the conductor of an orchestra—he makes sure that each member of the crew is in the right place at the right time and that they begin their job at precisely the right moment. As the day progressed, I began to wonder how the weather data from 0700 to 1400 (2 pm) changed, so I took a walk up to the bridge. 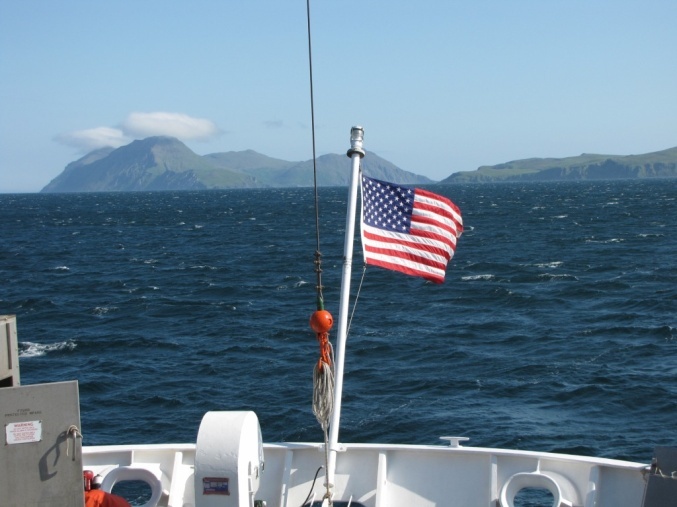 My guess was that, although there were still whitecaps on the surface, wind speed and wave height would have decreased, since we had anchored on the south shore of one of the islands (which would serve as a buffer from the wind). It seemed to me that the weather was so much worse this morning. Not so. The wind speed had actually increased by a few knots, although the seas had decreased by about a foot. When I am up on the bridge, I always find something new to inquire about. It’s a busy place—not necessarily busy with numbers of people, but with instruments, charts and readings. General Vessel Assistant Mark Knighton and ENS Jon Andvick were on the bridge. We sought a better anchorage southwest of Ukolnoi Is. when a 30 knot wind picked up. White caps cover the surface, the flag blows straight out facing aft. When you are standing on the bridge with a gusty wind coming at you, you immediately think of the anchors. Rainier’s anchors are made of steel. They weigh 3,500 lbs. EACH! The anchors are attached to the ship by a very thick chain. Chains are measured in a unit called a shot. A shot equals 90 feet, and each of Rainier’s shots weighs about 1,100 lbs. There are 12 shots per anchor. (So, can you calculate the approximate weight of the total of Rainier’s shot? How about the total length of the chain?) The depth of this small cove is between 9-10 fathoms. This is important in determining the scope, or ratio of the chain length to the depth of the water. According to ENS Andvick, when a vessel drops anchor, the length of the shot cannot be the exact distance between the vessel and the seafloor. An amount of “extra” chain must be released so that some of it sits on the seafloor, producing a gentle curve up to the vessel. This curve is called a catenary. The extra chain allows the ship move with the wind and/or waves and provides additional holding power. If either wind or current becomes too strong for the anchor, it will drag along the seafloor. If the ship has too little scope it will pull up on the anchor instead of pulling sideways along the sea floor. The anchor chain lies on the bottom and when the ship pulls on the anchor it must lift the heavy chain off the bottom. If there is enough chain that the ship does not lift all the chain off the sea floor, it will lower the effective pull angle on the anchor. By increasing the scope of chain that is out, the crew is increasing the amount of weight the ship must lift off the sea floor before pulling up on the anchor. I have to say that today was kind of an emotional one for me—because I did not go out on the launch. In a way, I feel like I let my team down. The others who went surveying on RA-4 had to do it without me. Even though my work as a Teacher at Sea may not be as significant as that of the crew members or hydrographers, I’m feeling like I am a part of the team more and more each day. That is in contrast to being an observer (which I still do plenty of!). As I kept busy throughout the day on the ship, I thought about RA-4 and what they were doing, what the conditions were like, if they liked what was in the lunch cooler today? I also realize and appreciate, however, that safety is the most important practice here on Rainier and when you don’t feel safe, you should never proceed. The crew on Rainier is organized into six separate departments: Wardroom (Officers), Deck, Electronics, Engineering, Steward and Survey. There are photographs of each person on board along with their name and title posted for all to see. They are organized by department as well as a “Visitors” section. There are several other visitors on board besides me and Dan Steelquist (the other Teacher at Sea) including hydrography students and officers from the Colombian and Chilean Navies. Pavlof Volcano is one of the most active of Alaska’s volcanoes, having had more than 40 reported eruptions since 1790. Its most recent activity was in August 2007. You can learn more about the volcanoes of the Alaska Peninsula here. 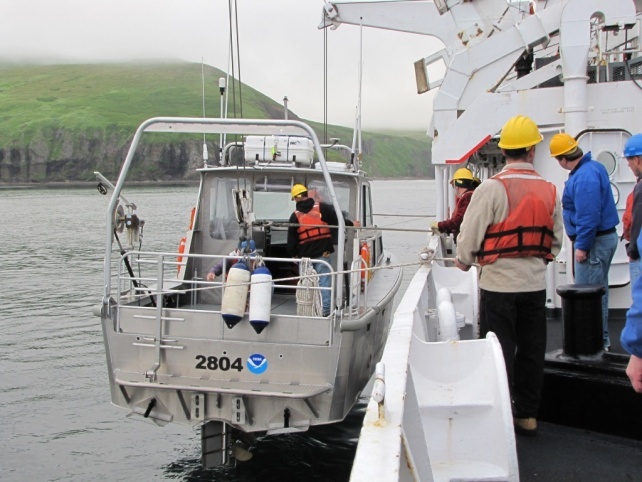 This entry was posted in 2009, NOAA Teacher at Sea, Stacey Klimkosky and tagged CTD, Hydrographic survey, multibeam sonar, noaa ship rainier, pavlov islands, polygon, seafloor mapping, ship anchor, ship crew, survey launch. Bookmark the permalink.